With illustrations by Ray Bradbury, Richard Corben, Harlan Ellison, Frank Frazetta, Ursula Le Guin, Michael Mooncock,J.R.R. Tolkien. 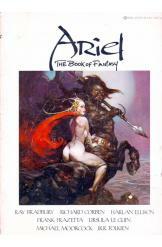 Ariel, book of Fantasy measures 23x31 centimeters, 80 pages.